Monster Toning, Monster Prices: It’s Still Just Bullion, Folks! 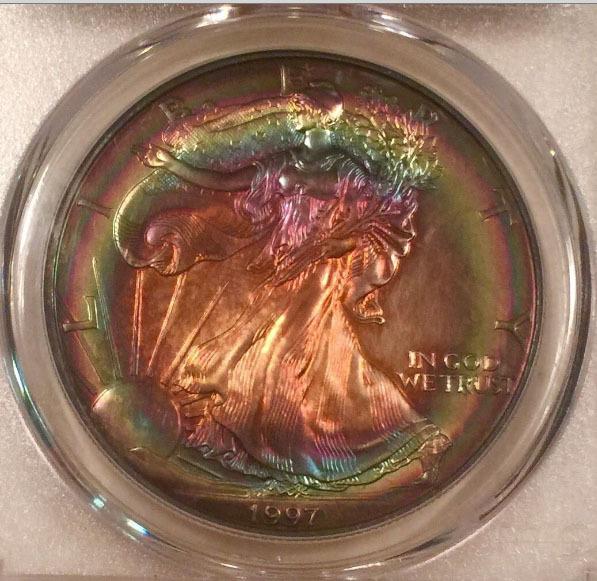 The screenshot above came in a search of “toned” and “monster” Silver Eagles on eBay. There were hundreds with “Buy It Now” prices ranging from $50 to $5,000. This article tries to put the issue into perspective for those considering bidding or buying one of these coins. You may want to do so because of a unique pattern, for instance, or perhaps because you want at least one for your collection before they vanish. Or perhaps you are trying to build a set of toned Eagles. Good toned examples are becoming increasingly difficult to find. And as always, a coin is worth only what someone is willing to pay for it. I don’t criticize sellers who ask for high prices. I don’t fault buyers who pay for such coins. My role is to report as best I can about the topic at hand, inviting your comments for perspectives that affirm or differ from mine. I admit; I am one of the few serious collectors of toned American Silver Eagles. 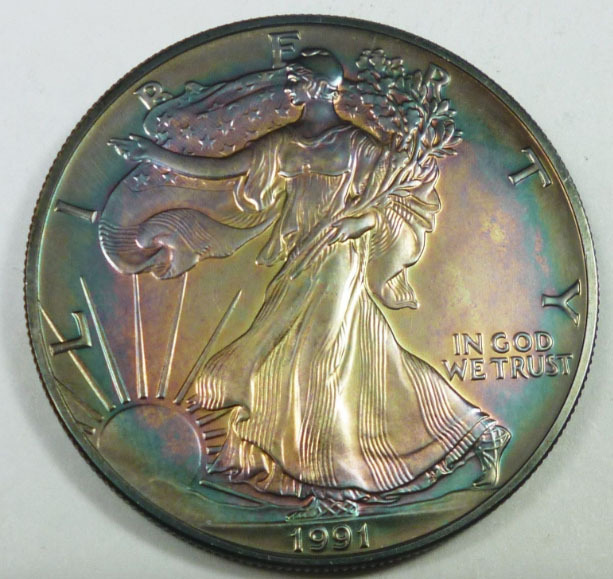 Last year I wrote about that in Coin Update in a post titled “PCI Rainbows: Get ’em while you can!” I noted that prices for these coins were rising because of the spectacular rainbow patterns created in a chemical reaction between the older green and gold PCI labels and the silver in the Eagles. I paid $180 for this in a PCI holder, again about a year ago, and then submitted it for crossover to PCGS and it slabbed at MS-68. Today this coin would sell on eBay for $400-$500, but only if I started bidding at $1. That’s a good indication of the market. Now you can find “Buy It Now” examples similar to this being offered for thousands of dollars. There are only a few collectors willing to spend hundreds of dollars on toned American Silver Eagles, and I may be one of them. But I won’t pay outrageous prices because the same money can purchase Carson City gold or MS-68 Morgan silver dollars. Investment in toned Eagles is risky. The market can be saturated, or it can fall when hobbyists lose interest. You should be forewarned, too. If you want to become a serious collector of toned American Silver Eagles, you have to be discerning. You should never pay hundreds of dollars for a toned coin with a fingerprint or a smudge or a patch of ugly tone or spotting. A toned coin worth hundreds of dollars should have no spots or other distracting marks. The colors should be vibrant, as on the 1996 coin above. 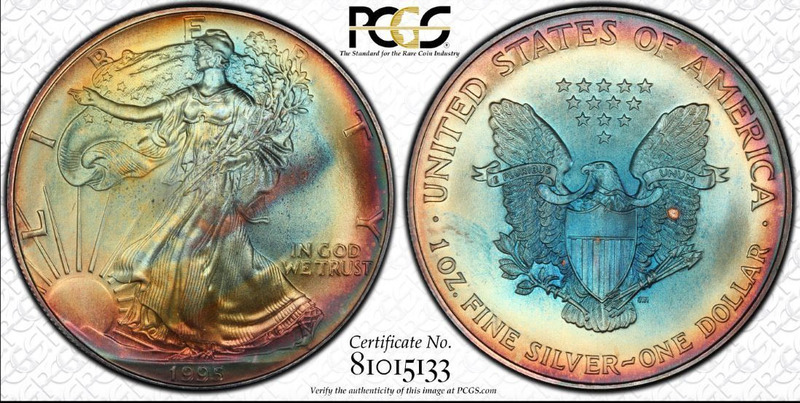 And the mint state should be gem or super gem (MS 65-70) in a PCGS holder. 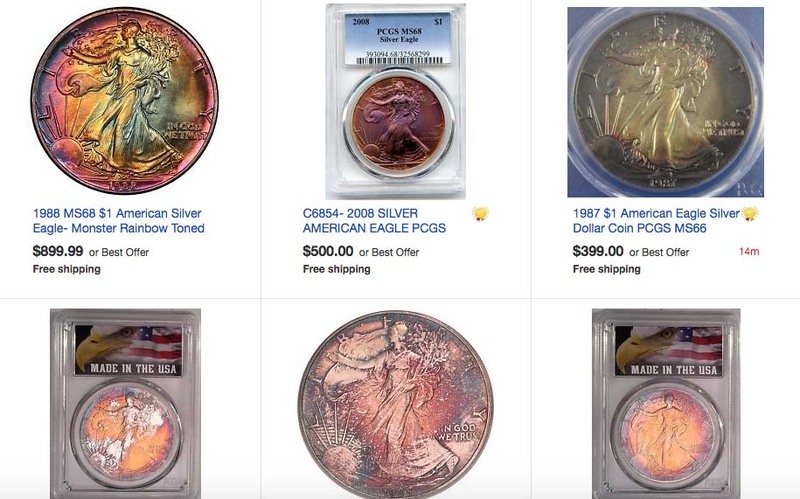 Many eBay sellers only know they have a coin, perhaps in a PCI holder or even in a crossover PCGS one, and think they can charge high prices on eBay. After all, they see that other eBay sellers are asking inflated prices for what they describe as “monster” toning. As such, you will find an array of spectacular rainbows as well as artificial, retoned, and chemically treated ones. It’s up to you to know the condition. Here’s a basic primer. This is a nice coin with a reasonable starting bid; the problem is the toning. 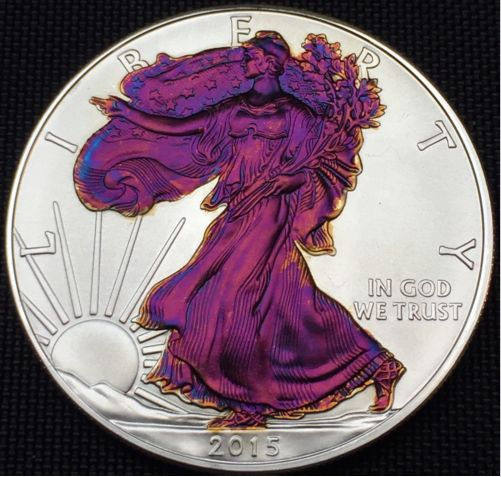 It looks like colors that occur naturally after a coin has been cleaned and put back in a holder or album. The rainbow is dull, an immediate giveaway to collectors like me. The more you analyze color patterns in PCGS slabs, the more you will get a taste for what passes as natural vs. artificial. The most common artificial colors are shades of blue and purple. This coin above looks like an artificially toned Eagle put into an older custom holder. On occasion, these will get by graders. In this case, some bidders will think the coin developed the rainbow tone after years of storage in this holder. I don’t buy that, literally and figuratively. 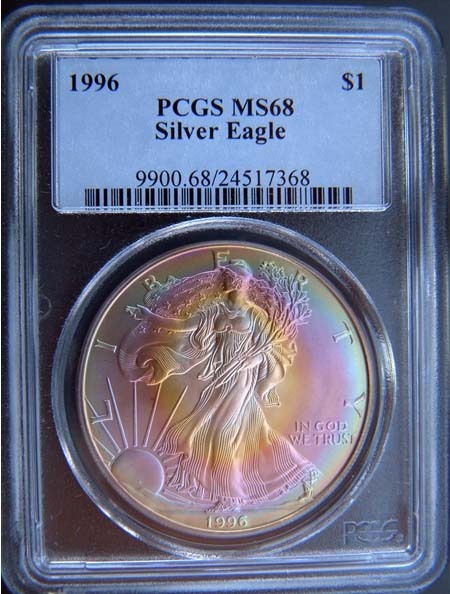 Hint: go to the seller’s store and see how many Eagles have the same rainbow patinas. If you find many examples, that should tell you something. To be sure, some sellers acknowledge the artificial toning. Others circumvent that question and let you decide. The seller wants more than $3,000. The years 1997, 1998, and 1999 PCI Eagles often tone like this. Last year I bought 5 out of 12 examples comparable to this for $75 each from a coin dealer selling on eBay. You can’t touch them for that price anymore. But you can find other examples with similar patterns for certain years. If you don’t want to pay thousands for a toned coin, you might shop on Proxibid or Great Collections rather than eBay. I can track coins from those platforms later appearing on eBay for double, triple, or quadruple prices. The above coin has an interesting pattern and is being offered on eBay for an exceptionally handsome price that I would never pay. That said, the owner had to spot the coin, discern the color pattern as being authentic and natural, and then send the specimen in for slabbing, and it did. There is expertise here. 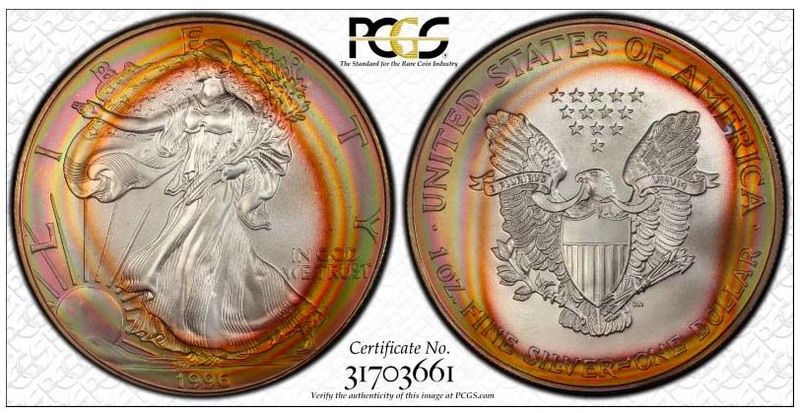 The toning did not just happen by chemical reaction in a PCI holder whose label reads “100% white,” a dead giveaway that PCGS has to slab the Eagle. Someone who knows coins and toning spotted this coin above. You may want to pay $2,000 or more for it. But again, folks, remember: It’s still just bullion. Better, perhaps, to develop a good numismatic eye for color. Prices for toned coins are higher than ever, but I don’t see them selling on eBay. The same coins at the same “Buy It Now” prices are offered month in, month out. There are a relative few serious collectors of toned Silver Eagles. Keep that in mind when you make an investment in one. Shop Proxibid and Great Collections first before buying on eBay. You might save hundreds doing this as the main buyers of toned coins like these seems to be on eBay. Keep in mind that PCI patterns, lovely as they are, often can be found in multiple coins. Learn how to tell natural from artificial color and buy a raw coin that slabs at PCGS. 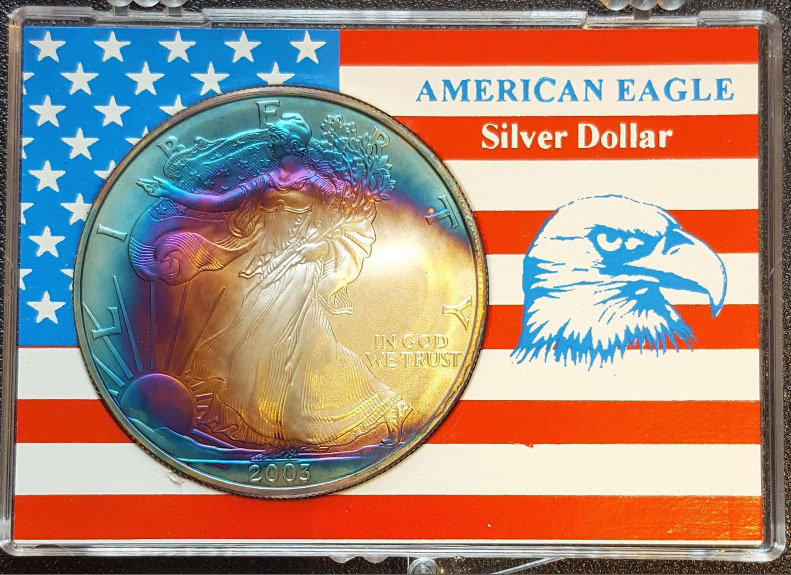 You can always buy an artificially toned Eagle from an eBay seller that acknowledges the colors are not natural. What do you think? Would you pay thousands for such a coin? Am I wrong about the riskiness of the investment? Let us know if you agree or disagree with my theme here: It’s still just bullion, folks! All toned coins are damaged coins because of the environment they were stored in and s/b body-bagged by all top tier grading companies.. Trinkets!!! Not a fan of any toned coins…I like the BLAST WHITE listings. Do a search on Ebay and see what you find! I actually found a Blast Whiter Peace Dollar on Ebay. It was only a NGC MS 61. But by far the best Blast White Coin, I have found. I never had any interest in toned coins but I did have a few at the same price as a non-toned version. I do like the blue proof nickels from the early 60’s proof sets but I never paid extra for it. Just unique, nothing else. Thanks to No1Hunter, Gary and Face 1004 for their comments. This is a very contentious topic. I appreciate your views! If you don’t like toning, then avoid PCGS-graded gold coins. I have MANY that changed from a nice gold color to a hideous orange color after passing through the PCGS grading facility. 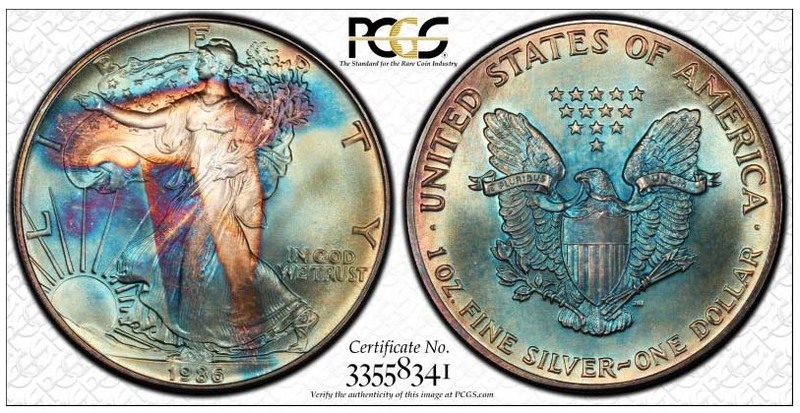 PCGS’s “toning through grading” process single-handedly changed my mind about purchasing graded coins. I think “artificial” vs. “natural” is meaningless. All toning occurs through natural processes. A better distinction would be “intentional” vs. “unintentional”. Joe, don’t blame PCGS. The reason gold coins turn orange has to do with dipping before slabbing. Even a wash in MS70 detergent will turn gold orange. This doesn’t happen immediately. It can take awhile. Thanks, Joe. Prices are outrageous. ‘Natural’ vs artificial toning? Who gives a hoot. They all look like garbage.